Managing your finances is an important part of maintaining your financial health. Although the ability to receive a personal loan is great, MoneyLion takes lending one step further by also offering wealth management and budgeting tools that designed to help you stay on top of your finances. While MoneyLion has not been around as long as some of its competitors, it has quickly made a name for itself thanks to a flexible loans system. Besides lending, MoneyLion provides excellent resources to help you stay in control of your spending and make sure you always have access to funds when you need them. Thanks to a strong support system, getting the loan you need when you need it is quick and painless with MoneyLion. While MoneyLion offers great flexibility when it comes to your interest rates and amounts, the company does not directly mention its repayment terms. MoneyLion works to bring you a strong and reliable loans service, and they note that their loan terms tend to be personalized to your personal needs. However, it is not possible to determine the repayment terms they offer without an application. When applying, you can receive interest rates between 7.00% and 30.00%, but we recommend you consult with MoneyLion specialists, as rates can change depending on your credit history. No matter the activity you are looking to fund, MoneyLion personal loans can fulfill your needs. The company does not place any restrictions on what you can use your loan for once funds have been deposited in your account. MoneyLion even lets you take small credit advances in order to cover short-term gaps in income and help you stay afloat during challenging times. MoneyLion allows you to take between $1,000 and $35,000 worth of traditional loans. While it would be nice to see a wider range, the company’s loan offerings are industry standard and relatively flexible when it comes to letting you apply only for the funding that you require. Even better, thanks to MoneyLion’s suite of wealth management and budgeting tools, you can always know exactly how much money you have, and how much you need. When you first apply for a MoneyLion personal loan, you will be asked to fill out a small form. This prequalification application can help speed up your process and get you the funding you need quicker. The company will only ask for some basic information and perform a soft credit check to prequalify you for one of several loan options. Once you have been offered terms, MoneyLion will perform a hard credit check and a more thorough examination of your personal finances, including your income and employment history. While it would be nice to see a more comprehensive qualification process, MoneyLion’s application is quick, to the point, and straightforward. One of MoneyLion’s biggest areas for improvement is the amount of information they offer. While their site features a helpful FAQ that covers some questions regarding certain aspects of their loans, they could add a better explanation for the entire the process. 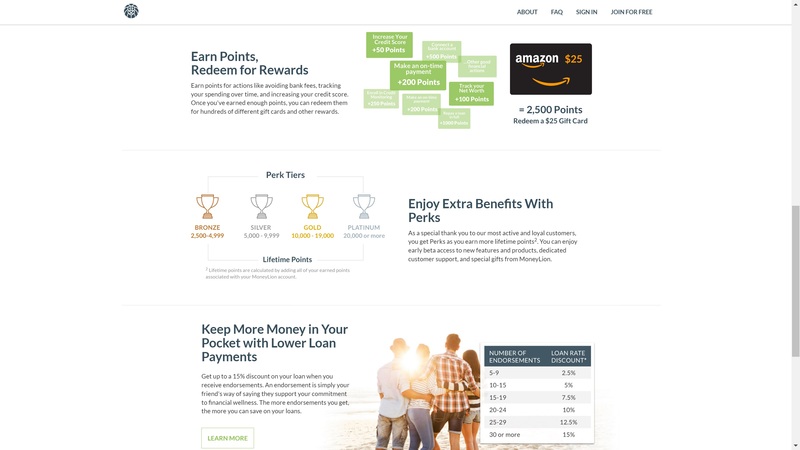 MoneyLion’s site does not feature a lot of information regarding the specifics of personal loans, and in our experience, could also improve general information about their entire personal finance suite of tools. On the plus side, the company offers a blog on their website that features great articles and advice on how to improve your finances and control your debt level. While it is also light on personal loans, it features helpful tips that can help you regain control of your finances. A quote application with MoneyLion never takes more than a few minutes. Thanks to the company’s technology and data driven approach, MoneyLion requires very little information to get you a series of quotes designed to fit your needs. The form is only a page long and does not require extensive sensitive information. MoneyLion requires your personal information such as name and date of birth, as well as more specific information such as your bank details and your income. With this information, they can provide you with an accurate loan offer. Even though there is room for improvement, MoneyLion offers a fresh new take and a 360-degree approach designed help you stay on top of your finances when you take out a personal loan. With great rates and flexible terms, MoneyLion helps guarantee that you are always able to cover a shortfall in funds. Thanks to a simple quote application and quick turnaround for funding delivery once your application is approved, money challenges can be a thing of the past. If you need quick access to cash, MoneyLion stands out as a lender that can help you meet your needs while helping manage your budget.